Contacts utilize passivated pure fine silver or pure Oxygen Free Copper. The body is constructed with brass and then platinum or gold plated to give a nice aesthetic appeal. The central contact assembly is made of Ultramid® and the negative contact uses Dyneon™. The barrel is comprised of brass with a shiny black piano lacquer finish. 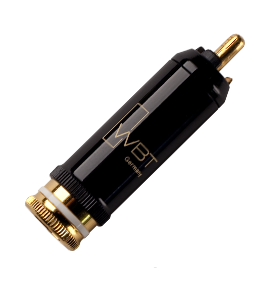 A characteristic impedance of 75 ohms makes this a perfect match for digital audio and video.